Every day I receive emails from people asking about green powders and protein powders and how it impacts the thyroid. “I was wondering if you could speak about protein powders and how they affect thyroid disease. For someone with Hashimoto’s or Graves, which kind of protein powder works best? I’ve been hopping from brand to brand trying to find the perfect one and notice that some make me feel bloated, others with greens seem to negatively affect my thyroid levels. What about something like vital proteins? I don’t drink smoothies daily, but sometimes I enjoy them before a yoga class and sometimes I like to mix collagen powder into tea.” – Katherine K.
Thank you, Katherine K., for sharing your concerns with me. Her email is a great example of the body speaking very loudly. She said she notices that some powders make her feel “bloated” and others “negatively affect” her thyroid levels. I personally do NOT recommend ANY of those powders (protein, greens and collagen) while you are in the process of healing your thyroid. First and foremost, the physical body is not designed to gulp down food (proteins, carbohydrates, fats). Our food needs to be masticated with our own digestive enzymes that are released from the parotid, submandibular and sublingual glands in the mouth. Those protein powders and green powders are NOT ideal for healing a thyroid condition. If the digestive system is compromised, swallowing proteins, fats and carbs, without starting the process of digestion in the mouth (where it’s supposed to start), is going to lead to uncomfortable bloating. Secondly, if the liver has been compromised or congested (allergies, hormonal imbalance, thyroid conditions) and the kidneys are feeling drained (chronic fatigue), the collagen powder in her tea can contribute to skin conditions like eczema and psoriasis, hives or rashes, as protein waste builds up inside the body without being efficiently detoxified from the system. 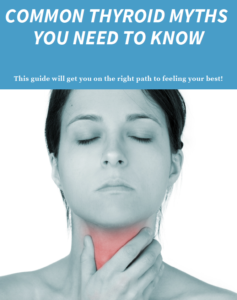 I know there is a LOT of information on the web that you may be trying to piece-meal together to create a thyroid healing plan, but that can leave you feeling confused and struggling for many years. Opt-in HERE to get my Common Thyroid Myths and other thyroid-healing information delivered directly to your inbox.